Brian Machovina received his bachelor’s and master’s degrees from Florida International University, where he studied the ecology of Amphiuma means, a salamander, in Everglades National Park. He then spent several years as a research assistant at FIU studying seagrass communities in the Florida Keys National Marine Sanctuary. 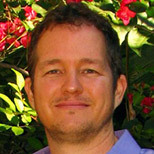 Brian moved to Los Angeles to establish a rainforest conservation foundation, Oasis Preserve International, which helped establish the Los Amigos Conservation Concession and Los Amigos Biological Station in Amazonian Peru. Subsequently, he worked for several years with Guayaki Sustainable Rainforest Products, where he helped pioneer a rainforest-harvested tea, Guayaki Yerba Mate, as a model of market-driven conservation and reforestation. Brian was also the Executive Director of the California Coastkeeper Alliance, a coalition of environmental advocacy organizations preventing water pollution and promoting kelp reforestation. Brian was also an owner and manager of Essential Living Foods, an importer of organic and wild-harvested commodities. Brian’s research interests for his doctoral degree at FIU involve the roles of agroeology in rainforest conservation. He co-invented Yonanas, a kitchen appliance that churns out a dessert with the taste and consistency of ice cream using only frozen fruit.